Moldavite - The Meteorite Exchange, Inc.
A Moldavite tektite is a natural olive-green tektite glass which formed about 14.7 million years ago when a meteorite impact occurred in Southern Germany. This meteorite impact formed the Nördlinger Ries crater and caused the formation of the moldavite glass. 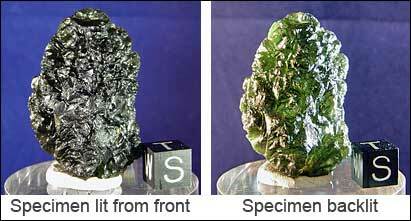 Moldavite tektites are chemically made up mainly of silicon dioxide and aluminum oxide and have a hardness of around 5.5 on the Mohs scale. Moldavites are dispersed over an area called the Central European Strewfield and are mostly green in color though rare brown types are found in some areas. The green tektite glass has a long history of being using in moldavite jewelry and is even more popular today. Moldavites are found still retaining their splash form appearance as teardrops, dumbbells or spheroids, but they are also commonly found as very spiky masses. Deep and sharp grooves valleys and ridges cover the entire surface of many specimens. The most exaggerated and transparent of these sharply grooved tektites are the highest prized by some collectors. Moldavites are generally made of much more transparent glass than any other group, however those that are brown in color come from a different area. These have been recovered in much smaller numbers and are therefore rarer and make great collection opportunities for the serious collector. The Moldavite images below use back lighting to show their detail and transparency.